Let’s face it: life in Mississippi just isn’t complete without waking up to a stack of light, fluffy pancakes. This iconic breakfast favorite pairs well with just about any other breakfast food, making it a must-have on your morning table. Treat yourself to a phenomenal breakfast at these 10 best pancake houses in Mississippi. Nearly a century of Mississippi history packs the space inside the Blue & White Restaurant, which dates to 1924. This hearty dose of nostalgia is serving up their famous hotcakes with your favorite breakfast items. Everything here is made fresh to order, and the food is so good you’ll want to stick around for lunch. Their impressive breakfast menu devotes an entire section to its pancake creations. Get ‘em in a stack or as one giant circular masterpiece, each topped with syrup after being cooked to perfection. Either way, you won’t regret it. If you’re craving a little flavor with your pancakes, here’s your pit stop. From fruits and nuts to Nutella or classic, you’ve got lots of options. They’ve even got a gluten-free variety so your special diet won’t stand between you and a delicious meal. Pancakes aren’t the main attraction here (their menu is huge! ), but they do tend to stand out among its all-star lineup. Their light, fluffy, made fresh to order, and come with plenty of other fixings to fill your stomach and start your day off right. Fans love the funky retro atmosphere that sends you straight to the past. 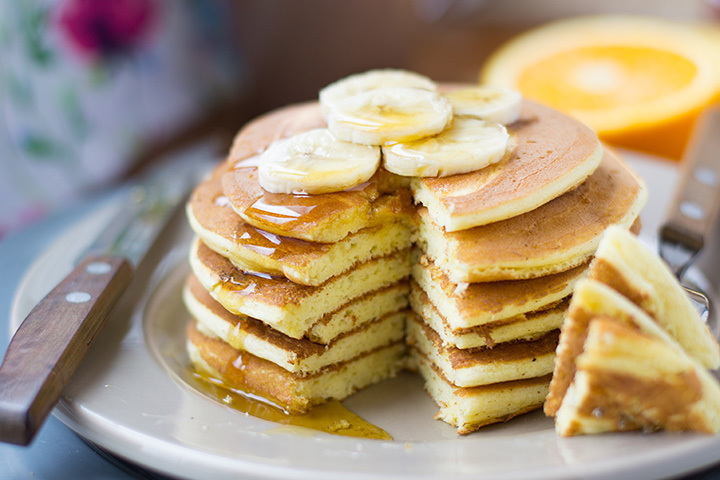 Pancakes or oatmeal pancakes? It’s a tough choice, but one you won’t regret either way. Big Bad Breakfast offers some of the best options in breakfast history, made for hearty eaters with hearty appetites. If you feel guilty about indulging in a bread-laden meal, rest assured there are plenty of healthy options on the menu to complement your pancakes. Cozy, homey, and inviting, Double D’s diner knows how to deliver great pancakes and great service. Their fans love the reasonable menu prices and quality of food. There’s also plenty of variety to fuel even the pickiest appetite. Starkville Cafe is the perfect little hometown eatery that every community needs. Large portions, fair prices, and friendly service combine with exceptional pancakes to give you a pleasing breakfast experience. Just make sure you get there early—this place is the talk of the town and tables fill up quickly! A friendly little breakfast food-crafted smiley face welcomes you as you arrive, setting the tone for an upbeat dining experience you won’t soon forget. Everything here is spot on, from the service to the food quality, especially the pancakes. Get them as a meal or a la carte—just make sure you come hungry! This no-frills pancake house combines home cookin’ with southern hospitality and will easily become your first choice for breakfast. You can top your pancakes with pecans, blueberries or strawberries, or get them plain or buttered. Each stack comes with your choice of bacon or sausage to complete your meal. This charming little breakfast nook lies in the heart of downtown Clarksdale and attracts visitors from all over for a tasty morning meal of pancakes. Their pancakes look as good as they taste and their fans agree no one serves a better breakfast than they do. Every pancake is cooked from scratch, made to order. If you’re anywhere in the area, you owe it to yourself to stop by.